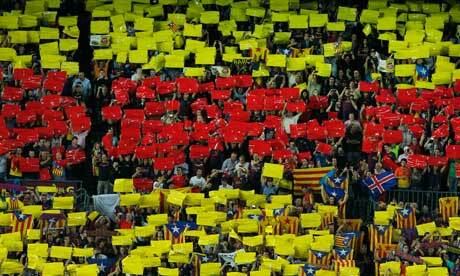 The Wall Sport Journal: Could Catalonia’s freedom change Barcelona football club’s future? Could Catalonia’s freedom change Barcelona football club’s future? Today, Catalonia goes to vote for a new future, one that might lead to independence from Spanish rule. 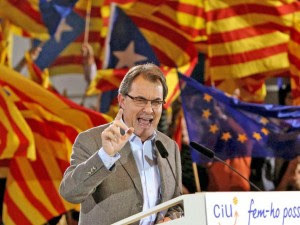 Artur Mas, the leader of political party Convergència i Unió (CiU), called for these elections after the historic protest march in September. More than 1.5 million people had stepped out of their homes with Catalonian flags in hand and onto the streets to demand freedom. This freedom march was the biggest since World War 2. The political stage is currently sharper than a razor’s edge. There are 135 members of parliament and 68 seats are needed to win. Mas’ political party is currently opposed by Socialists (PSC) and the People's Party (PP), both vehemently in opposition to the idea of an independent state. The city of Barcelona and its football club Barcelona FC is the epicenter in this rapidly unfolding drama. Barcelona FC has always been “more than a club” to their fans. Under the military dictatorship of General Franco, when all forms of public expression was clamped down, Barcelona football club became the only legitimate channel for the Catalan people to show their resistance. This video from the Guardian perfectly sums up how much the football club means to the local people. At the derby against Real Madrid in Camp Nou this October, football surprisingly took a back seat and 95,000 Catalan fans got up and chanted pro-independence slogans. 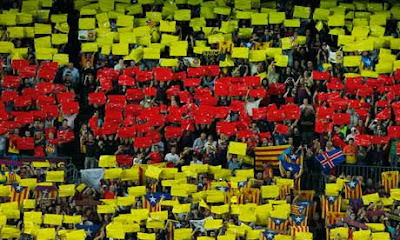 The fans staged this protest when the clock in the stadium struck 17 minutes and 14 seconds to symbolize the year the Catalan forces were defeated by the Spanish army under Philip V.
Amidst this major political development, there lies also a possibility that there might be a paradigm shift in the world of football. Barcelona football club, home to some of the biggest superstars such as Lionel Messi, along with cross-town rivals Espanyol might have to ply their trade away from the La Liga and at a local Catalonian league. According to a survey conducted by the Catalan government-funded research group CEO, 57% of the Catalan population would like to move away from Spain. However, only 22.7% wanted a new Catalan football league and 38.1% would like their football clubs to continue being a part of the La Liga. If Catalonia does successfully free itself from Spain, there could still be a possibility that Barcelona competes in the La Liga and participates in one of football’s biggest showpiece derbies. There are instances around Europe where clubs football clubs of one country play in a foreign league. Currently, Swansea city compete in the English Premier League although it is a Welsh club. Also, Cardiff city, home to Manchester United legend Ryan Giggs, is part of the Football League Championship in England. Further across the English Channel in France, AS Monaco has a rich history in Ligue 1 and is one of the most successful club sides in the country. Monaco has even represented France in European Cup Competitions, including a semi-final run in the Champions League in 1994 under the stewardship of current Arsenal manager Arsene Wenger. Not far from home, in Spain, there lies an example of this aberration in the form of FC Andorra. Andorra is a nation stuck between France and Spain and its biggest football club is part of the Spanish league. 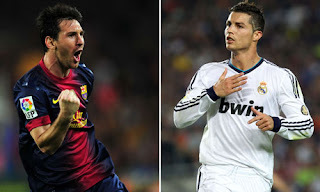 The quest for independence, just as it is, might rob millions of fans across the world from one of its biggest spectacles “the El Clasico” and the chance to watch Cristiano Ronaldo face-off against his arch-nemesis Lionel Messi. Here is hoping that Barcelona FC continues to go about its “business-as-usual” post the elections. Very interesting read. I dont think Barca would move away from the La Liga even if Catalonia moves away from Spain. The loss (financially and emotionally) would be huge. The El Classico rivalry will continue !!! Thanks Vatsa. I agree Barca moving away from the La Liga would be a huge loss both financially and emotionally. *Correction: the name of the Catalan politician that is the president of the Generalitat de Catalunya is Artur Mas. And yes, FC Barcelona will remain a strong party on the RFEF and can opt (will opt) to play at the La Liga, as it is (will) apply to all Catalan teams. An independent Catalan country would see its football and sport teams, in general, struggling to find place in European organisations like UEFA, due to what they represent to the Sport which is Football. Although, it would not be as difficult for Catalonia to join the EU. Thank you very much Arthur. I have made the necessary edit to my blog. The option stated by you would mean that Barca's future in the La Liga is secure, which is a big relief. But like I was discussing with someone this could open up the possibility of a seperate Catalan National team, which would essentially be the best players of the current record-breaking Spanish team. Do you happen to have any thoughts on the matter?